Explore the state’s history, geography and natural resources in maps. A map tells a story that can’t be told in a few words or photos. If you’re trying to describe Texas, great in size and diversity, you’ll need a lot more than a few words. What better way to comprehend a statewide situation than to see visual data across the entire area, all at once? 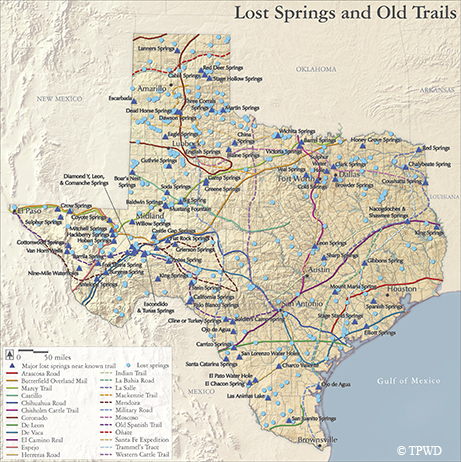 The Texas Landscape Project authors David Todd and Jonathan Ogren have been kind enough to share a dozen of these maps on our pages, selecting topics that fit with the Texas Parks and Wildlife Department mission statewide. We’ve sorted 11 maps into sections focused on cities and suburbs, streams and lakes, weather and more (a few of them are presented here), but first, we’ll take a trip back to the state’s earliest days, when maps meant the difference between life and death for travelers. Readers can learn more about The Texas Landscape Project at the book’s companion website, www.TexasLandscape.org. More than 2,000 springs have been documented in Texas, many of them critical to the early exploration and settlement of the state. Numerous western explorers — including de Vaca, Coronado, Moscoso and Espejo during the 1500s and Oñate, Castillo, Bosque, Mendoza, La Salle and De León during the 1600s — relied on these watering holes for survival. Pioneers depended on these same Texas springs as they traveled along El Camino Real, La Bahia Road, the Old Spanish Trail, the Atascosa Road, the California gold-mining road, the Butterfield Overland Mail route and the Chisholm cattle trail. Today, as many as 400 of these historic and environmentally important springs have dried up. The impact that loss has had on migrating wildlife, local plants and endemic fish can only be guessed. 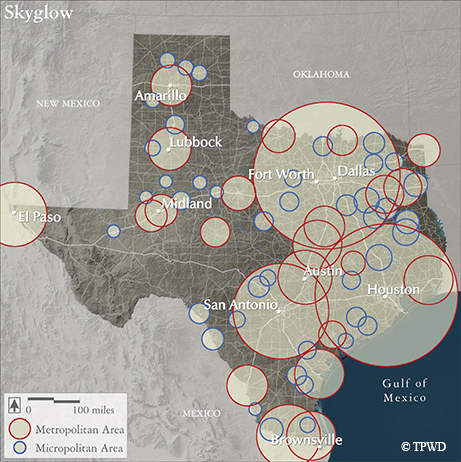 State statutes now protect light-sensitive observatories and military bases across Texas; towns and cities are passing ordinances to minimize unnecessary lighting, joined by neighborhood and landowner associations. At TPWD, we’re making changes to protect the night skies over state parks. Enchanted Rock, Copper Breaks and South Llano River are certified Dark Sky Parks. Texas hasn’t always been dotted with lakes, but now we’ve got more inland water than any state except Alaska. 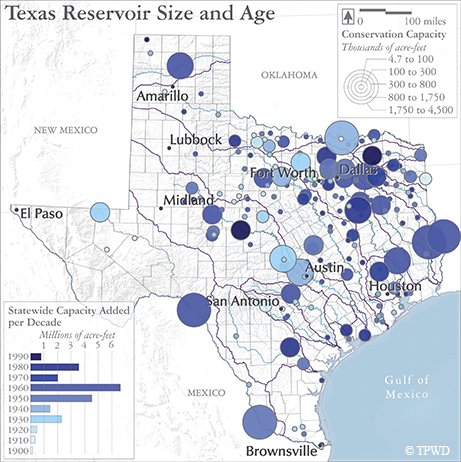 The great drought of the 1950s motivated us, and now Texas boasts 190 reservoirs exceeding 5,000 acre-feet (1.63 billion gallons) in capacity, flooding bottomland hardwood forests and affecting river flows. Reservoirs are manmade systems, often lacking in native aquatic plants. Damming a stream and flooding the terrestrial habitat around it creates a submerged waterscape of dead trees, brush, old roadbeds and whatever else was built on the land. Decaying vegetation releases nutrients into the water that jump-start the fishery, but conditions can decline over time as the flooded vegetation degrades and water quality worsens. TPWD’s Inland Fisheries biologists coordinate a growing patchwork of partnerships aimed at revegetating reservoirs, resulting in improved water quality as well as more food and habitat for fish (making anglers happy). 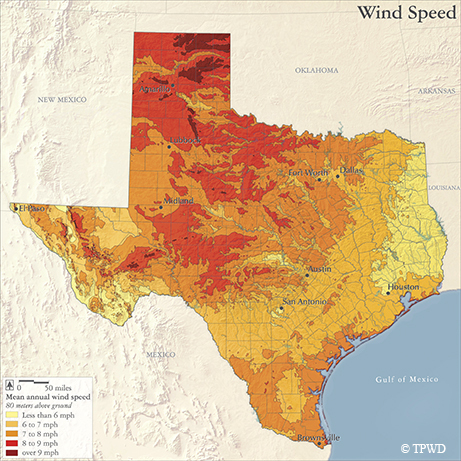 Texas is blessed with a rich wind resource throughout much of the state. Railroads first used windmills to pump water for their steam engines as early as 1860 near Houston. Another important use was to water cattle in dry areas. From the 1920s through the 1950s, some ranchers and farmers even installed Jacobs wind generators that charged car batteries, ran radios and lit homes. The arrival of rural electricity in the 1930s replaced most windmills, but there’s been a phenomenal resurgence of wind turbines in recent decades. There are concerns about wetland sites, road impacts, and bird and bat strikes, but the TPWD Wildlife Habitat Assessment Program stands ready to assist project developers to address problems. More information and maps are available in the June 2017 issue of Texas Parks & Wildlife magazine, or in our mobile app.